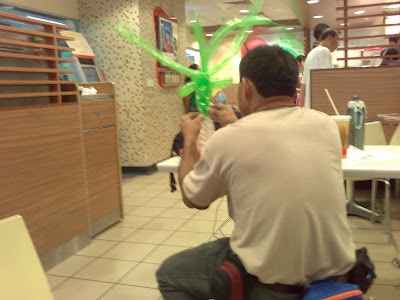 A middle aged man in MacDonald weaving a colorful Aztec styled crown for women. He did it under 10 minutes with rough hands that remind me of my father. It was sold later to father of a Caucasian girl. I pass by him. I thought I hear a sigh and turn back. I saw two holes on a stiff and darken mask, emotionlessly graze upon his current creation. Without joy. Image of balloon crown burst on little girl head haunt me on my way back. Maybe I am too tired tonight.